Since March 2, Kaidie has been running about in Second Life as Kaidie Absent, having been kidnapped by The Good Pirate, a.k.a. Chutha Indigo, away from Life 1.0. On 19 April 2010, they had a visitor Mono Fugue a.k.a. 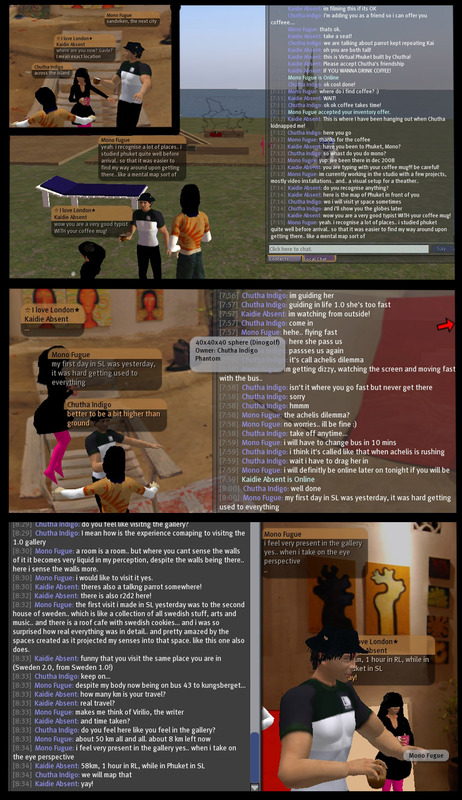 Monologues, in Virtual Phuket, which is built by Chutha Indigo. And what fertile ground for getting disoriented: Phuket, a beach resort in Thailand vs. Phuket 2.0; Gavle, Sweden vs. Nondon, UK; GMT 14:30-19:30 vs. GMT+1 in Sweden vs. SLT 06:30-11:30; experience vs. imagination; memory of actual visit to Phuket 1.0 vs. (re)visit of Phuket 2.0; online vs. being disconnected; immersion vs. distance; tropical sunset vs. still-frigid Gavle; catching a bus in Life 1.0 vs. flying, gravity-free, in Life 2.0; panting in RL vs. coffee-sipping in SL. The following is a reflection written by Mono on his experience. Fourteen years ago I had my first encounter with a high speed internet connection. People in my surrounding rarely used internet and barely had any meaningful use of computers. Five megabytes was a very big file and digital camera photos were stored on 1.44 Mb floppy disks. At this time I was determined to become a future space cowboy, found rocket science a dream but language studies a hell. Little did I know that my perception of this would shortly flip and pretty much lay out a road that I’ve been following ever since. Text-based chat room, from which I was wired to the world extended my known borders from the small village I was living in to some form of metaphysical realm I could only see but not touch. Yet, like an addict my hunger grew for this super-speeded (back then) information overload, and oh what a fascination that was! Just the knowledge I was sharing the same space with an interesting girl from Tasmania to a shaman somewhere in the U.S. blew my mind. In contrast my village shrunk and I pretty much lost any interest in what it had to offer. One day I heard of an online project, or yet more, like a community in a virtual world, called Alphaworld caught my attention in an instant. It offered a graphical landscape in which you could move around, build houses and interact with the other habitants (sounds familiar?). Now, my school back then disallowed the students to install any programs (as alpaworld required) and to tell you the truth, computer power was not exactly magnificent back then. I didn’t even own a computer back in 1996, and when I later got one it had a 16 greyscale screen, began coding websites in black and white and doing Photoshop work in.. eh.. greyscale. So what happened with Alphaworld then? The closest I got was connecting to this promised land with a 28.8K dial-up modem from my friends house (in the same village) who’s parents just spend one months salary on getting the latest 66 MHz PC. Alphaworld turned very distant as my presence in this virtual world was limited to a 1 frame per minute refresh rate. My only memory from this world became a printed map, a Mondrian-type pattern which completely drenched the paper with bubble-jet ink. Fourteen years, some hundred hardcoded websites, programming and complex video editing skills, two new languages, a college degree and thousands of hours in front of flickering screens and a lifetime later I’m sitting on a bus to the same village. In my lap I have enough computer power to make Sputnik literally a blip in space, radiated by 16.8 million colors in my face and a mobile broadband connection through an iPhone I have never ever been as wired as I was that day. Despite the fact that I’m in eternal love with landscapes speeding by, have a fetish for airplane take-offs and living with a constant urge to get geographically lost there are moments I rather just make my trip from a to b in an instant. This day I would however spend my time in a different way, being invited to a meeting in Second Life seemed a rather pleasing experience and a way to make my journey a bit closer to that sensation of instant teleportation. Taking into account I had no greater interest in what this virtual community had to offer I was still surprised of the resemblance to my nostalgic Alphaworld. Except, this time I was physically moving my body, yet largely unaware of what was actually going on around me. My eyes and ears were wired to another space. While I was traveling down the highway between two Swedish cities I was mentally visiting the Thai island of Phuket. Emotions were sparked as I recognized places I have physically been in or had some sort of memories connected to it. 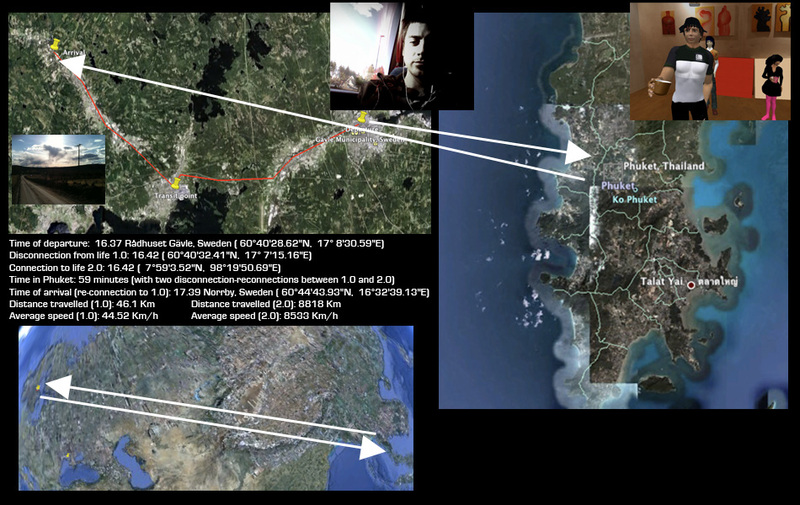 While hovering above the virtual soil of Phuket in spherical photo realistic representations, jumping from one gallery to another, one virtual space to antother, while sipping from my virtual coffee cup, the bus driver drove me some 25 kilometers. The time-space continuum seemed to have broken apart as it only exists as a hiatus in my mind. Instead, my physical bus-ride in Sweden now only carries the memory of a visit to Phuket with a pleasant coffee/gallery/chat-session with Kaidie Absent and Chutha Indigo. Projecting myself to Second Life while letting my body stay in First Life was however not a painless experience. Having the sensation of a nearly related astral projection; traveling without moving (or in reverse) triggered a weird kind of nausea… being there, but being here, but being there. I was not entirely physically disconnected, yet completely wired, and absolutely mentally in another space, floating in a liminal realm of inbetween-ness. At some point I thought to myself, is this how it feels to be born into a new world, you panic at first, have no idea what it is that you see nor how far away the walls or borders of the world are… and slowly vectorized graphics build up a world around you and you get a sensation of a relation to it, which is a slow progress in itself getting acquainted with what there is. The difference here, getting born for the second time, is that the prerequisites for living a second life, in one way or another, forces you to abandon the life you came from. A moment later you switch back and ask yourself, where does my first life end and where does my second life continue? Where do I start, where do I begin in my journey 3.0? Guest post by Michael Larsson. Michael Larsson is a visual composer who experiments with photography, video, motion graphics or any other (non) electronic method to manipulate light and visuals. Michael’s presence in Life 2.0 can be found on his Website, as well as his Twitter and Vimeo pages. The image on top is created by Michael, while the images below have been captured by The Good Pirate, a.k.a. urban planner Chuthatip Achavasmit. This entry was posted on Tuesday, May 4th, 2010 at 21:30	and is filed under DOING IT WITH OTHERS and tagged with layers of lives, multiplicity, tourist, travelling, web 2.0. You can follow any responses to this entry through the RSS 2.0 feed. You can leave a response, or trackback from your own site.